Steypuiðjan which later became SET, was founded in 1968 with the production of concrete sewer pipes and a decade later, insulated steel pipes for district heating. 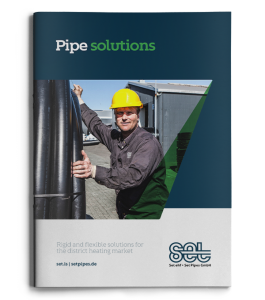 A wide range of other pipes and piping systems have followed, with all production taking place in 3 factories, SET in Selfoss SET in Mosfellsbæ and Set Pipes Germany. The last four decades have seen a very active and competitive market enviroment and circumstances have called for vigilance and rapid response where the emphasis has been placed on a high level of technology, productivity and quality control. Great knowledge and experience has evolved in the field of manufacturing technology within the company. This also applies to knowledge in the field of marketing and services for pipeline industries. SET´s customers are essentially municipalities, wholesalers, service providers within the construction field, hardware stores, contractors and the largest energy and telecommunications companies. All these parties have adopted purchasing formats governing open offer and price comparison in accordance with international agreements, ensuring SET´s ability to meet international standards in price, product and service quality. Education has been strengthened considerably within Set in recent years, operating its own training scheme „SET-Plastic Industrial School“ with pipeline technology training for its customers and staff. The Icelandic pipe market in recent years has placed an increased emphasis on education and quality aiming to increase service life and reduce maintenance of piping for the ever growing and more complex systems. In the production, supervision and quality control policies have ensured the success of SET. The company has for years had a certified quality system in accordance to international standards. SET aims to carry out production and service activities in the field of industrial installations and meet all requirements for operation at any time, while ensuring continuous innovation, improvement and knowledge growth for the company and its clients.